Red jeans, well actually all colored denim was huge a few years back. I remember stocking up on every color I could find and thinking I was the coolest kid on the streets. That trend, like many, has faded away but that doesn’t mean you still can’t rock colored denim. Pair them with a simple sweater for a laid back weekend look or step it up a notch and add a casual blazer to make them more weekday appropriate. Red is probably the safest color to wear and will match well with all shades of blues and creams. Mustard yellow is another great autumn option or if the weather is still warm enough try a light green denim paired with a linen shirt and blue sweater. What do you guys think about colored denim? Is it a thing of the past? Oh and I've got an exciting giveaway coming up next week. More info coming soon. 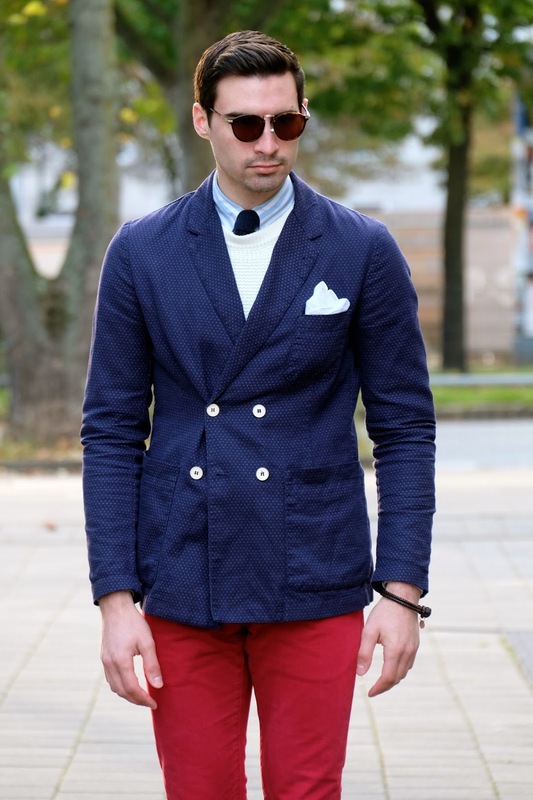 I like colored denim, it's a great way to make an everyday outfit more interesting!